I was playing around this afternoon trying to assemble an interesting still life setup using one of our recently-acquired dome clocks. I don't have a lot of useful ornaments or bric-a-brac to populate a still life, and February is a dreadful time to go looking for colour around the garden, but I did find a petunia that was still holding onto some flowers. Using the still-life stand I built last month, I added a few small vases and even some lemons and got to work arranging. I spent hours trying different arrangements and lighting, taking photos as I went. 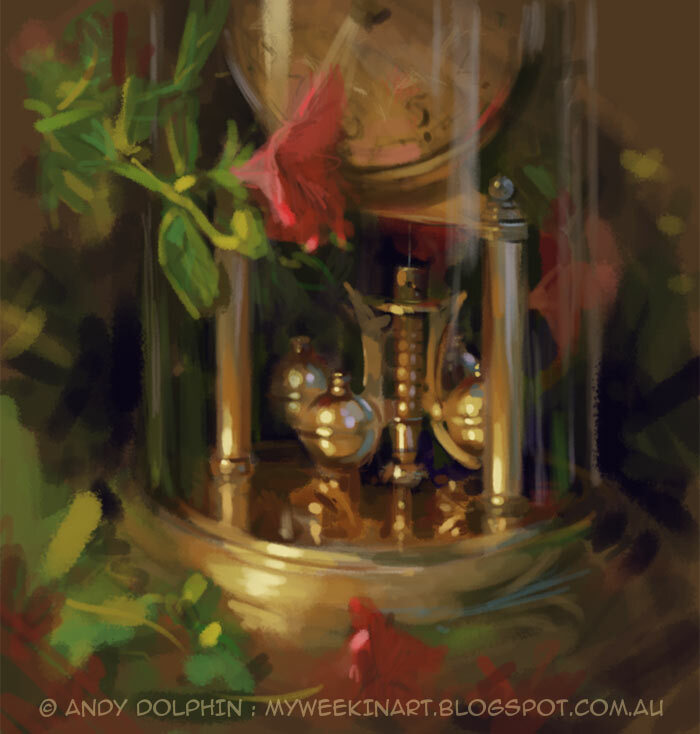 With no time left to start an oil painting, I did this digital painting of a close-up of the clock pendulum.